Hello Everyone! I am very excited to announce that I have joined the Tuesday Color Challenge design team at The Outlawz. This is my first week, and our sponsor is The Paper Nest. 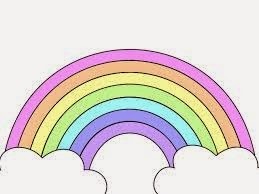 Our challenge this week is to use at least 3 colors from this beautiful pastel rainbow. There is no twist for this week's challenge. For this card, I chose to use Garden Ellie...isn't she adorable. I am also using two Doodle Pantry digital stamps for this card. The daisy is from the Charlie Daisy set and the sentiment is from the Encouraging Words set. The first thing I did was cut the frame using my Silhouette Cameo. The design is ID #73381. Then I removed the inside cut from the frame and brought the images and sentiment into the software and did a cut and print. I colored the images using my Copic markers (dress - V20 V22, RV10, RV13; shoes and bow - RV10, RV13; skin - R00; cheeks - R20; hair - Y11, Y13; watering can - C0, C2, C4; daisy - G20, Y11, Y13). I cut the grass (design #56521) and distressed it with G20, but it absorbed so you can't see it much. I distressed the bow frame with pale plum ink and the white insert with barely banana ink. The blue layer was distressed with soft sky ink. I hope you can join us for this week's challenge. Thank you for stopping by and visiting my blog. Great card Susan and I love the colors in your rainbow. I signed up for your blog so I should be getting your posts from now on. I have missed seeing your creations. 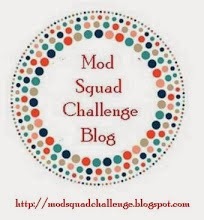 Love that you hosted the Mod Squad Challenge. Love how fancy that die is, cute card...Thanks for joining us over at Brown Sugar Challenge! I just love that frame you created Susan. Perfect for that adorable image! Great card! Thanks for sharing this with us at Through The Craft Room Door. Please come play along with us again! Super cute! Love the sentiment! Thanks for joining us at Simply Create Too!